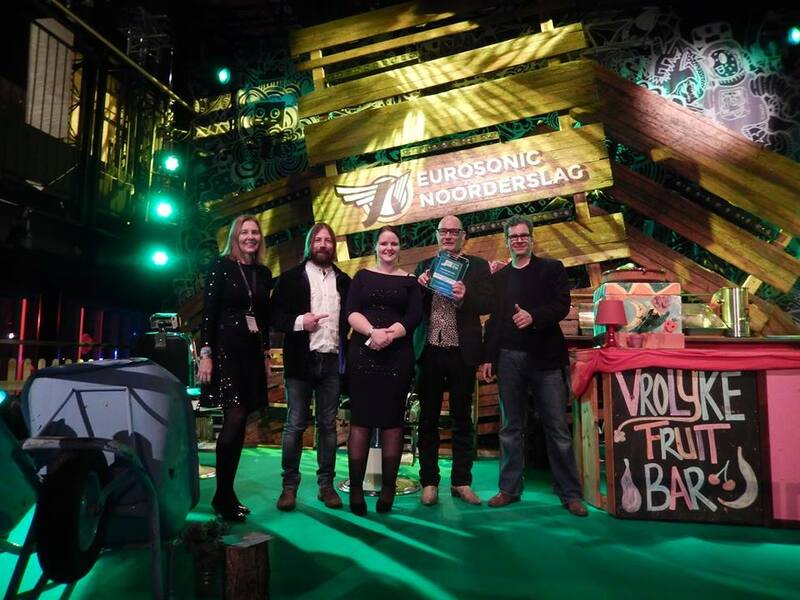 What a great evening we had at the 6th European Festival Awards at Eurosonic Noorderslag 2015 in Groningen. 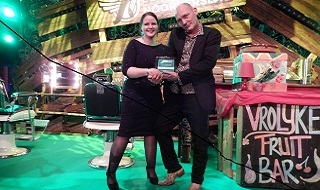 We announced this year’s winner of the Green Operations Award and it’s Roskilde Festival & Stop Spild Af Mad! Congratulations! You did an absolutely stunning job! Including social responsibility and change, (food) waste reduction, volunteer work, sustainable leadership, Inspiration and passion… loads of passion! Maybe it was the most impressive action regarding sustainability to be seen in the 2014 festival season. Roskilde is already a monster and temporarily the 4th largest city in denmark. Taming it, running it as sustainable as possible and on top doing such a great job as the STOP WASTING FOOD people did, is priceworthy. Almost 30 tons of food were saved at the 150+ food stalls at the festival alone. Food that most likely wouldhave been thrown away now went to homeless shelters, refugee camps etc..
For the Green Operations Award jury “green” does not only mean “environmental”. When we talk about sustainability, the social aspect is also taken in account. More and more one aspect cannot be parted from the other one. A festival with 30.000 volunteers that is run as a charity is a social experiment with an impact on the environment that is very well handed by the organizers and teams. It it is an successful example for a couple of decades now. A shining example for many festivals no matter whether new or established. 27,5 tons of food collected and prepared to 65.000 meals by 70 chefs and volunteers in ten full working days and delivered to 60 institutions in need. That’s a green operation and it’s worth the award. Let’s not forget the other four on the final short list. Their performance was absolutely awardworthy as well! Well done Ilosaarirock, NorthSide, Shambala and Welcome To The Future! keep up the great work!